If privacy and discretion are your top concerns, you want to find a ghostwriter. A professional ghostwriter is a writer you never see – literally a “ghost writer”. You are the author and your name is the only name that people see. When you hire a ghostwriter from The Happy Guy Writing Services, you get more than just discretion – you get a writer committed to writing the words that sound like they come from you. We have ghostwritten fiction and non-fiction of every genre, from fantasy to mystery to Christian to biographies to business. We have ghostwritten speeches and song lyrics and articles for academic journals. Our writers are passionate about every project they work on; that’s why you get the very best from them. Hiring our professional ghostwriters will increase your chances that a publisher or literary agent will pick up your manuscript. And this is where to find a ghostwriter. Many seemingly “ordinary” people with a special story to tell have also hired ghostwriters. You can join the ranks of these celebrated authors now, by filling in this form. Very important – you will build a close one-on-one relationship with your ghostwriter. We believe this is critical for the success of your book, speech, screenplay or article. Yes Thank you David!! I am very, very happy with the outcome! Debra was fabulous to work with and an amazing person! I highly recommend her for future projects. She will definitely be my choice again. Hey Kristen, What more can I say…You hit it on the nose of what I was thinking. Thank you. And the 36 pages…All I can say is you write what I am thinking and I’m still blown away. I’m so glad I went with you and SEO WRITER. Thank you for fulfilling my vision on my screenplay. You see what I want to be seen to others. Thanks. Are you looking for a ghostwriter? There are many reasons for hiring a ghostwriter agency. Here are some of the reasons we have heard from clients over the years. Tap or click to read more reasons to hire a ghostwriter. You hire a ghostwriter to save time. Busy people know they won’t have time to write their book themselves or to blog consistently. They hire a ghostwriter to manage their time. This is particularly true of entrepreneurs, coaches, solopreneurs and businesses. Not everyone realizes how much work goes into drafting a manuscript. We get many people, especially fiction and biography clients, who have been “trying to” write their book for years or “meaning to get started”. When they set out to find a ghostwriter for hire, it’s because they are at the point where, “Help! I need a ghostwriter for my book! Authors hire ghostwriters to get started. It’s not just time that deters many would-be authors. Those who find a ghostwriter will become authors. Those who stare at a blank screen will never be authors. Sometimes it’s too hard to get started on your manuscript. Call it writer’s block. Call it inertia. Call it what you will, but some people will never launch that book-writing project without a freelance ghostwriter to take it on. Your ghostwriter knows where to start and how to get an outline going. She knows how to organize your information into a manuscript that is not just easy to read but hard to stop reading. People find ghostwriters for their skill and experience. There are some things that almost everybody can do. Almost everybody can speak. But few people can stir an audience to action. Almost everybody can run. But few people can complete the Boston marathon. Almost everybody can write. But few people can keep readers on the edge of their seats. Many authors have a great story, but they know they need to hire a professional writer to bring it alive. Sure, they can write clear and effective office memos and emails, but that is not the same thing as writing a book or a blog post. In fact, not all ghostwriters are suited for every project. Some have the skills and experience to write fiction; others do not. Some have the skills and experience to write screenplays; others do not. Some have the skills and experience to write business articles; others do not. Some have the skills and experience to write speeches; others do not. Just because someone is a writer does not mean they are suited to every project, and we are careful to assign only writers well-matched for your project. If you have letters to write, a report to prepare and a speech to deliver, blog posts to publish and other items to write, you should probably find a ghostwriter service for at least some of them. Even if you write some of those items well, chances are a professional can help with the others. Even so, not everybody is even able to write clear and effective office memos and emails. Some people never were that educated. Some people want to write in a second or third language. If English is not your first language, hiring a ghostwriter can convert your articulate thoughts into an articulate and persuasive manuscript. Looking for a ghostwriter? We can help. We are a quality-focused ghostwriting agency. For a free quote on ghostwriting your book, report, speech, article, blog post, business letter or screenplay, tap or click the red button to the right. Working with a ghostwriter is different than working on your own. You will need to give your ghostwriter precise instructions so that the writing comes out exactly how you want it. These are a few tips to follow to make your ghostwriting project a success. Tap or click to read more on how to work with a ghostwriter. Every writing project begins with defining your audience. Ideally, you can give your audience a complete persona – name, age, gender, career, etc. When working with a ghostwriter, this becomes even more critical. You might have a hazy image of your reader in your head, but it needs to be crystal clear if you are to communicate it to the ghostwriter. Even the best ghostwriter can’t read your mind. Know the tone you want to set. Any story or explanation can be written in a variety of ways. Your ghostwriter needs to know from the start if you want to be formal or friendly, fact-based or sensationalistic, artistic or urban. Date every item and include in a timeline. 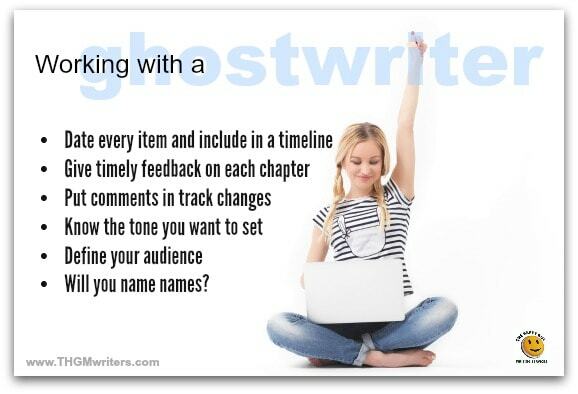 Before you hire a ghostwriter, prepare a timeline of all key points. The more detailed your timeline, the better your ghostwriter will be able to follow the story and not miss any details. Don’t send a dozen emails with several dozen letters, depositions, email trails, etc. Each item should be sent individually, with a unique title and its own reference on the timeline. Provide timely feedback on each chapter. Your ghostwriter will provide you with drafts of each chapter as they are completed. What happens next depends greatly on how you’ve arranged to work with your ghostwriter. You might have decided that work on your manuscript stops until you provide feedback. Or you might have decided to continue writing the next chapter while your review the current one. Whichever way you choose, it is important for you to give your writer timely feedback. If work stops while you review, timely feedback ensures that the writing isn’t delayed. It also ensures that the ghostwriter begins the next chapter with the previous one still fresh in her mind. Yes, your manuscript will flow better with timely feedback to your ghostwriter. If work continues while you review, timely feedback ensures that the ghostwriter doesn’t have to backtrack. If you need changes to the chapter, those changes might affect the next chapter that the ghostwriter has already begun to write. Even worse if the ghostwriter gets several chapters ahead of your review. Not only would changes mean a lot of extra work for the writer, but it means that the writing risks being less organized, like a road that gets patched many times rather than having a single coat of fresh pavement. Give comments in track changes. Just as editors provide comments in track changes, you should do the same for your ghostwriter. This helps the writer see exactly what changes you want, in case they affect the next chapter. Or in case your ghostwriter has a better way of making those changes. If the changes you see are bigger, you’ll want to explain. For instance, if you want a change of tone. Or if you feel a certain aspect needs more detail. These require a full explanation by email or maybe even a call. This an important question from the start. Will this be a “true crime” or a factual account? Or will it be a fiction based on a true story. Or it will be a true story with names, places and identifying features changed to protect the innocent and the nervous. This is where it helps to consult your lawyer before even hiring a ghostwriter. Most importantly, they will never reveal their connection to your book or screenplay without your express permission. “Where can I find a ghostwriter? We have some of the best ghostwriters available. For a confidential, free quote on ghostwriting your book, speech, article, blog post, report or screenplay, tap or click the red button to the right. You need a ghostwriter! Our professional ghostwriters are for hire, eager to work with you and for you. If you are looking for that perfect ghostwriter, let us know how we can help you by completing the form on this page.